Rebecca DeBoer and John Voth star in the return of The Lion, the Witch, and the Wardrobe at Vancouver's Pacific Theatre. Photo by Ron Reed. Theatre is a magical playground, but some shows remember that magic better than others. Ron Reed’s The Lion, the Witch, and the Wardrobe remembers. In a time of multi-channel LED lights, smoke machines, and even special effects make-up, it is a nostalgic kind of rebellion to remind audiences that theatre can also happen with two actors, a sheet, and a good story. Adapted by Pacific Theatre’s artistic director Ron Reed, this iteration of C.S. Lewis’ classic story takes place when the Pevensie children have grown up. On this particular Christmas, eldest brother Peter and youngest sister Lucy meet in the old spare room, coming face-to-face with the wardrobe of their childhood. What follows is an imaginative retelling of their adventures in Narnia as children, using only the everyday items of the room and their imaginations to colour the elaborate fantasy world. John Voth’s Peter is amiable and relaxed yet dexterous enough to flop between physicalities for comic effect. His flip from the walk of Mr. Beaver to that of Mrs. Beaver was a delight. 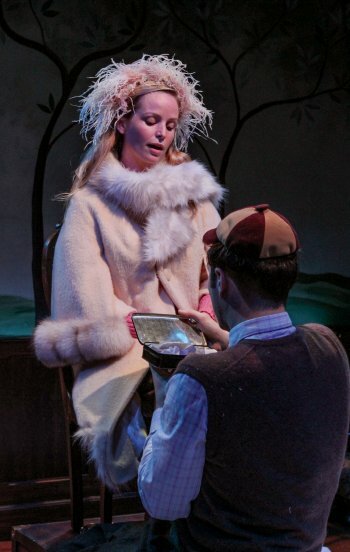 Lucy (Rebecca deBoer) and Peter (John Voth) return to Narnia as adults in Ron Reed’s stage adaptation of The Lion, the Witch, and the Wardrobe. Photo by Ron Reed. Rebecca deBoer’s Lucy is spirited and mischievous, retaining the child-like openness that makes her character one of the most beloved in British children’s literature. It is DeBoer’s subtle gravitas as she takes on both Aslan the Lion and The White Witch however, that allows the audience to buy in to the central conceit. By setting the bulk of the story as an “acted-out” flashback though, the tale does lose any sense of real tension or stakes, as we know the outcome from the start. This is compounded by the amount of narration required from the two performers which causes the production to drag at times. That said, the magic of Lauchlin Johnston’s multipurpose set and Dianna Lewis’ metamorphic props creates moments of theatrical flair when the story grows dim. The acting is physical, the humour is spot on, and the simplicity of the set is sure to give the kids in the audience ideas for back home. While its frame story removes some of the dramatic tension, The Lion, the Witch, and the Wardrobe injects enough fun and nostalgia to warm the hearts of all ages. The Lion, the Witch, and the Wardrobe. Adapted by Ron Reed from C.S. Lewis’s novel. A Pacific Theatre production. Directed by Sarah Rodgers. On stage at Pacific Theatre (1440 West 12 Ave, Vancouver) until December 29. Visit pacifictheatre.org for tickets and information.